Flagstaff - Flagstaff turned out to be a bit of a gem. We went on a short hike and generally just relaxed. The hike took us very close to the mountains and we spotted a couple of deer. Grand Canyon - I'm quite good with words any superlatives I use won't do the Grand Canyon justice. It truly is a spectacular sight, more breathtaking than any other I've seen. We pitched up a Mather campground before decided on what trail to hike. We chose the Bright Angel trail in the end which in total is a 12 miles although we only planned to hike 9 miles to the Indian garden deep in the canyon. It was a hard hike, espiecally coming back up, but well worth the effort. The predicted time for the hike was 6-8 hours, we managed it in 5 and a half. The Indian Garden is an area in the canyon which is much more fertile than the rest, we were treated to the sight of a deer on our arrival as it gracefully appeared from a thicket of trees. Unfortunatly we didn't hike far enough to get a sight of the Colarado river even though we were only a couple of miles away. If we had set out earlier we would probably have hiked all the way down which isn't recommended in one day. We didn't start hiking until gone 12 however and didn't won't to be in the Canyon come nightfall as it was quite a steep rocky trail. Only downside was an awful nights sleep in the tent, the ground was hard and it was very cold. 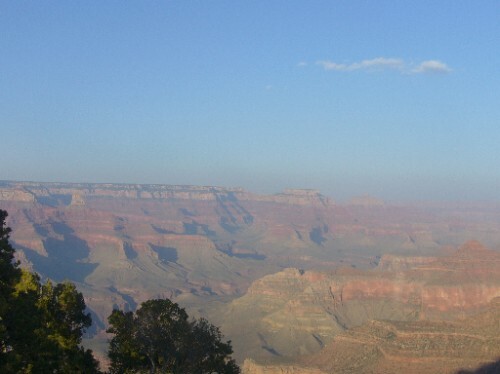 The Grand Canyon is a must see, I can't imagine there are many places more beautiful in the world. On a side note we had a funny incident on the way to the Canyon from Flagstaff. We boarded the shuttle and were waiting to leave when the drive stepped on and accussed a passenger of sneaking on. He claimed there should only be 10 passengers on the shuttle rather than 11. I was quietly reading my book at the back when he said "Which one of you sneaked on. Hey was it you at the back with the book". It turned out he had got his maths wrong. We are boarding a Greyhound headed to Vegas in an hour and a half, we should arrive at about 9 tonight. Saturday night in Vegas is an exciting prospect. From natural wonders one day to gaudy man made ones the next, lifes not so bad. Nice to see Liverpool got a win against United, shame the Dons lost.